What Are Vinyl Fences’ Prices? If you’re thinking about installing a picket, privacy or post-and-rail fence on your property, you may think that a zero-maintenance vinyl fence is out of your price range. The truth is that Bufftech PVC fences are comparable in cost to wood or composite materials. When you consider the long life, strength and low maintenance characteristics of PVC materials, you’ll see why more and more property owners choose Bufftech fencing from our discount-priced fence supply company. Is DIY Vinyl Fence Installation Difficult? Bufftech vinyl fencing is designed to make installation as simple and easy as possible. Our experts will help simplify your installation even more. With your order, we will provide a post layout sketch, post counts, and a full materials list. Complete installation instructions come with each order. Are Bufftech PVC Vinyl Fences Strong? Every Bufftech vinyl fence is designed and manufactured to stand up under tough weather conditions. The vinyl components include impact modifiers and plasticizers that make the fence components more flexible and resistant to impact. In addition, the design of each component emphasizes its strength. Bufftech PVC fences are built to last. What Color and Texture Options Are Available? Bufftech vinyl fencing is available in 23 color and texture combinations. Options vary, depending on the style of fencing you select. These options let you customize the look of your DIY fence and establish a unique style. Ask about all available options for the style you’re considering. How Does the Cost of Vinyl Fencing Compare with Wood Fencing? While the initial cost of your Bufftech vinyl fence is higher than for a wood fence, that’s a one-time cost. Over the lifetime of your fence, other costs of wood fences are eliminated, reducing your cost of ownership over time. You’ll never have to paint or stain your PVC fence or replace rotted posts, panels or boards. Can I Use PVC Vinyl Fencing Around My Swimming Pool? Depending on the style of fencing you choose, Bufftech vinyl fencing can be used around swimming pools in most communities. Before buying any fencing for swimming pools, check with your local jurisdiction for details about requirements. Then choose the Bufftech style that matches or exceeds those requirements. How Wood Compares to Vinyl in Fence Maintenance? Wood fences require regular maintenance and repairs, including painting, staining and replacement of boards and posts. The finish of a Bufftech PVC vinyl fence resists staining, discoloration and shrugs off rain and sunlight’s UV rays. If your fence does get dirty, though, simply hose it off to remove loose dirt or dust. For more stubborn dirt, apply a non-abrasive liquid cleaner and wipe it down. Every Bufftech fence is a low-maintenance fence. How Vinyl Compares to Wood in Harsh Weather? Bufftech PVC vinyl fencing materials from CertainTeed have been tested in Accelerated Weathering Tests. The results show that these fences stand up superbly to everything Mother Nature can dish out. Bufftech fences are built to hold up for a lifetime of exposure to weather conditions and retain their beauty and strength. Will My Vinyl Fence Fade or Turn Yellow like Wood? Sunlight contains ultraviolet light, which can cause fading in many fence materials over time, especially wood. Bufftech vinyl fencing from CertainTeed resists fading or yellowing from UV exposure. It contains Titanium Dioxide (TiO2) throughout the vinyl in a 10 parts to 100 ratio. This reduces the effects of UV light and inhibits fading and yellowing. Is Vinyl Fencing Good for Horse Fences? Wood fences seem to attract horses to chew or crib fences. That’s hard on the fence and bad for horses as well. With a Bufftech PVC fence, cribbing is far less likely, due to its smooth surface, and toughness. It’s just not as attractive to your horses. If necessary, a “hot wire” can be added to your fence easily to further inhibit cribbing. How Long Will My Bufftech Vinyl Fence Last? Every Bufftech PVC fence is designed to last a lifetime. A limited, transferrable manufacturer’s Lifetime Warranty covers your panels, posts, pickets and gates. Properly installed, your new fence is a permanent enhancement for your property. What Makes Bufftech Vinyl Fencing the Best? Buffetch is a division of the CertainTeed Corporation, a trusted supplier of a wide variety of materials for home and commercial use. In business for over 100 years, CertainTeed means that top quality is built into every product they manufacture, and all manufacturing is done right in the USA. Unlike some vinyl fence manufacturers, you can count on Buffech to be there for you if you need replacement components or need to add to your fence. Quality is designed and manufactured into every component of your Bufftech PVC vinyl fence. We take great pains to select only the best products to offer our nationwide and local customers. After researching vinyl fence products from a number of manufacturers, we’ve selected Bufftech PVC fencing from CertainTeed. 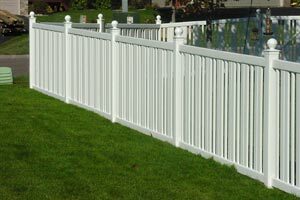 Top-quality design and manufacturing, a wide variety of styles, and the Bufftech limited lifetime warranty on its fences’ finish make it our best choice. When you order DIY vinyl fencing from us, you’ll know you’re getting the very best, and at the best possible price. Call us today to order, for a price quote, or to discuss any fencing need.